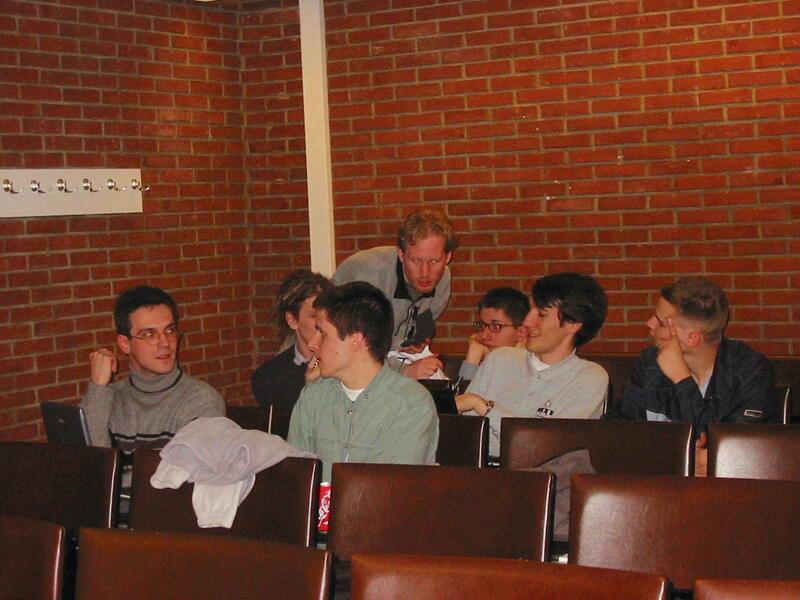 This interview was originally planned to take place during the FOSDEM, but we didn't have the time to do it, so it was held on IRC on Tuesday, February 19th 2002. Of course, the log had to be edited and reshaped. The result is this informal interview. Philippe: Philippe Fremy, (freehackers team), interviewer. Thomas Capricelli: support, hosting, photos and help (freehackers team). Bluebird: How was KOffice started ? David: Torben Weis originally started KOffice. He wrote the libs and Reggie (Reginald Stadlbauer) wrote KWord and KPresenter. Torben also wrote KSpread. Bluebird: Where are they now ? David: Reggie is working for Trolltech. He is behind QtDesigner. This is why it had a "Tools" menu for inserting things, instead of "Insert". Tools is what KWord and KPresenter had. Werner: Torben is working at the Technical University of Berlin IIRC. Last time I talked to him he was developing a CASE tool or so. Nothing KOffice related. Bluebird: How and when did you get involved in KOffice ? Thomas: Ohh, I don't recall exactly when. Something like 2 or 3 years ago. I picked up where Reggie left off since he ran out of time. KWord was unmaintained at the time. David: One year ago. KWord was really needing some help, so I jumped on the boat. I proved that it was actually possible to use the richtext stuff in KWord, which Reggie and Thomas had started to doubt, I think. Backporting QRichtext to Qt2 was easy. The real challenge was redesigning KWord around it. Reggie and Thomas had great plans, but no time for them, so I just did it. David: In general I realized that I never *ever* started anything new in KDE ;) I always joined in the effort started by someone else. I'm the "manpower that makes things possible", maybe, but I never take the initiative to break things myself. I joined Waldo for ksycoca, Coolo for kio-make-it-cool, etc. Bluebird: Could you give us a short report of who is doing what on which application in KOffice right now ? Werner: I am mainly hacking the core libraries and filter related stuff. David: I am implementing WYSIWYG in libkotext (common to KWord and KPresenter), and some other KWord fixes. I really thank Mandrake for letting me work fulltime on KDE. Laurent: I improve KPresenter (zoom + page), add the DCOP interface to KWord/KPresenter. I also fix some bugs in KChart. Thomas: I am hacking the tables in KWord. For 2 versions they have been rewritten twice, lets do it another time. This time I actually think I know what I am doing. So I am implementing it the way I think it should be done. Plus fixing the bugs that bug me in other parts of KWord. Plus I am always bugging David about stuff he is doing in KWord. Laurent: Nobody is working on kugar and kivio. David: Kontour is being redesigned by 2 or 3 people, but although they had the time to break everything, it doesn't look like they have time for fixing things now. :) Krayon had nobody for quite some time. Recently someone committed a few fixes, though. All in all, it's almost one main developer per application only, and random contributors... surely not enough. Bluebird: What about KFormula and KChart ? David: KFormula has a single developer, Ulrich K�ttler with little time. KChart has two parts. The core engine, developed by Klaralvdalens Datakonsult (Kalle's company), and the KOffice part, on which Laurent works sometimes. Bluebird: What about the remaining ones, in the KOffice cvs: KPlato, graphite, kosoap ? David: those 3 are unreleased alpha stuff. Werner: graphite is my little pet project, nothing worth writing about in the current shape. Thomas: KPlato is a planning application, its been through the design phase. The design is implemented and it is basically waiting for people to finalize the design, I.e. fill the classes allready there. KPlato is 'designed' by 5 people talking on a mailing list without a line of code. I have implemented that design completely. The design I am talking about is just the data classes, nothing more. Naturally the next thing that has to be build after that is a GUI. But that is simply not done. Bluebird: a good project planning application is really something missing. Thomas: I know, that is why I jumped in, hoping to kickstart the project. But after almost no code was written by others I found that this was not worth my time for now. Bluebird: So basically, you are 2 full time, paid developers, plus some filter developers, plus 3 or 4 part time contributors. David: hmm, more than 3 or 4 I think, if you allow "part time" to be very small. David: lots of filter developers, if you count them. Usually one per filter. Bluebird: It looks like some help would be welcome. David: Yes, definitely. On the applications (e.g. Krayon, KPlato, Kontour etc.) we definitely need help. Those apps have almost nobody working on them. The other apps do need contributors, too. Bluebird: What is the programming experience required to contribute ? David: People usually assume that writing an office suite is very difficult That's not true. _Some_ part of it are difficult (can I say WYSIWYG ? ;), but there are many many missing features that are easy to add. Laurent: Any help is welcome, whatever the experience. Some people can create templates or write documentation, tutorials, etc... It's not necessary to know C++. Of course, you must know C++ if you want to hack on KWord. Werner: There's also a need for GUI guys and artists. We don't have a KoShell icon, for example, and the user interfaces are a bit crowded. Bluebird: Do you have places where you would like to see someone contributing right now ? Bluebird: What are the planned improvements for KOffice ? David: Right now we are busy fixing the things that we broke. In KWord, due to the WYSIWYG text layouting. In KPresenter, due to zooming support. This sounds small, but actually, it led to a big design change. Laurent: I am fixing KChart and adding some features. Footnotes for KWord is also planned. Werner: My short term goal is to implement the rest of the new filter system. The long term goals are e.g. a better clipboard, better support for embedding, a general clean up of the core libraries, ... I also plan to work on graphite a bit more if the free time allows it. Bluebird: Do you have a list of features that will make it into the upcoming release ? David: Now about the long term plans... Those really depend on how much man power we can get. We have a list for what's already done (see the KOffice release plan, more stuff will be added to that while being done) However, I can't say what will be in the release that is not already done. That's where time / number of developers is the problem. Thomas: My long term plans for KWord (which is all I am restricting myself to at the moment) is adding more stuff that makes it easier to use the application. Like markup macros. And character styles, frame styles and page styles..
Bluebird: You planned 3 Beta and 1 Release Candidate, isn't that too much ? KDE3 had originally 1 beta and 1 rc (which turn into a second beta), no ? Werner: KOffice gets very few testers. Some people download it and work with it for five minutes. This simply doesn't highlight nasty bugs, but just real showstoppers. There are only few people actually e.g. writing a longer letter or creating a whole presentation. Bluebird: So you need more users too ? David: Actually, betas are a really great thing for developers. We can release code for people to test, without having to worry about it being considered a final version, and hence a must-be-completely-stable one. More developers is much more needed than more users. Not handled bug reports are the proof of that. But it's true that more (advanced) users helps finding the source of some problems. Sometimes. Thomas: We have a number of end-term students (last year project in the company) basically they all say that KOffice is not usable at the moment, most bugs are being fixed, when that is done the not-enough-users problem will go away. Bluebird: The must-ask question: what is the state of the import/export filter for MsOffice ? Werner: We have some import filters, at least. The WinWord import filter imports tables and text/basic formatting (pictures are disabled). The Excel import filter works quite nicely. David: There is currently no export filter for MsWord. This is an area that definitely needs help. Werner: As I worked on that myself I can assure you that exporting to WinWord is *not* funny. Thomas Capricelli: Could we have some more information about picture embedding in KWord ? What's the problem ? Thomas: Picture embedding has gone a long way since the horrible support in 1.0. Pictures are correctly scaled, correctly and intuitively placed and can be embedded or placed external of the main document. Lots of stuff has to be done, but it is getting there quite rapidly. Bluebird: I remember the guy of wvWare starting a project for creating a generic Word import/export. Did that work ? Bluebird: And on the side of abiword ? Weren't they supposed to help out ? Bluebird: Can you reuse the stuff from OpenOffice ? Werner: It's really hard. They use libc and nothing more. They have their own toolkit and stuff. You can't just take parts of it and reuse it. And the design is, well, hard to follow. Bluebird: But they somehow managed to understand how MsWord works, so I imagine you can at least get hints from there ? Werner: yes, it helps, but it's very time consuming. Bluebird: What is the difficulty with writing it ? Is MsWord's format so messy ? David: Afaik one very messy part is the incremental saving, i.e. appending the changes at the end of the doc instead of modifying the real data. Werner: They don't save the full file all the time, but append "diffs". For example, I spent 3 days hunting a bug in my filter. The bug was in the specification. David: I also suppose that writing an export filter for a closed commercial app is awful - if it crashes or says "can't open", you have no way of debugging that The format is just partially documented and somehow broken, not fully secret & broken. Werner: There are situations where WinWord just crashes without further notice if one bit(!) is set incorrectly ... incorrectly as in "according to the SPEC" ;) It's really not funny to develop that, I can assure you. So when you don't get paid for it you lose the motivation and move on to something more interesting. Bluebird: We sure all can understand that. David: Sometimes I wonder if I shouldn't spend some time continuing the wv2 stuff. Bluebird: I did not pick it up: you are working on the filter directly in KOffice or working on wv2 which will be used by KOffice ? Bluebird: Yes, not very funky stuff to work on ! Bluebird: Some distro should give a kick to that ! I can't think of any Redhat support, but we could contact Suse. David: Mandrake already sponsors two fulltime KOffice developers. Maybe it's time for the other distros to give a hand ? Bluebird: Everyone seem to be thinking OpenOffice is the Office Suite of choice for Linux. But I am not sure it integrates as nicely as KOffice applications do. Bluebird: KOffice has much more potential: it was developed by very tiny manpower in comparison with other suits or applications. David: Yes, the power of KOffice is that it fully reuses the power of Qt and KDE. KOffice can embed documents thanks to kparts, it has configurable toolbars thanks to the XML-GUI, etc. This means KOffice development can concentrate on the actual office functionality. The rest is provided by Qt & Kdelibs. Thomas Capricelli: Did you read about latest RMS statement about KDE/Gnome cooperation ? What do you think about it ? David: this doesn't apply to KOffice, since there's not really a gnome office suite. :)) But I find this very good that RMS states this. I think this 1) finally gives some credibility to KDE for the "GNU only" people. 2) it might actually foster some cooperation. Bluebird: Is the Euro symbol supported ? Laurent: The Euro works in KOffice no problem ! David: Yes. see this link on the KOffice website. Bluebird: And i18n support ? Are various exotic languages correctly supported ? Thomas: Yes, see this example. Bluebird: I wonder if Abiword does that too. Do they use Pango and Gtk 2.0 ? Werner: Yes, Abiword does that too. At least Dom Lachowicz, the guy I talked with about wv2, was implementing that. But they do their own Right-to-left support, from what Dom told me. I have no idea if that is in the latest stable release, though. Laurent: Abiword is not integrated in Gnome. It uses some gnome libraries but not much. Ben: Doesn't Microsoft want to use xml file formats in future office formats? If yes, wouldn't that make import/export a lot easier ? David: Good question. It mostly depends on how they do it. The main advantage of XML is that it's readable. At least that will help. As for conforming to any spec of theirs, we know how bad they are at that. They will surely "extend" XML to do things their own way. Ben: What about Aethera in KOffice? As a user, I'd LOVE to see Aethera in KOffice. How much do you trust theKompany to actually deliver Aethera, would you put it into KOffice CVS if it was an open license ? David: Aethera is a mailer, right ? Then it has nothing to do with KOffice. It's important to understand what KOffice is about. It's about editing *documents*, and being able to embed documents from other KOffice components. There are plans for more KDE PIM stuff, integrating kmail with contact / calendar stuff. The kdepim module in CVS. This needs help too! KOffice doesn't mean "stuff you do at the office" in general. KMail is in KDE, but not in KOffice. Laurent: Nobody works on Aethera ! At least publicly. Ben: The latest aethera beta is 4/2001! Werner: They also have Kivio there, but it doesn't seem to be maintained either. Bluebird: Where would you like to see more cooperation with other projects ? Bluebird: Do you think it would be possible to define a common free format for Office files, like it was done for .desktop files ? Werner: The first step is the common packaging format. This is discussed on the office_standards list, on their website. But I don't know the current KWord DTD good enough to participate in such a discussion. The other plan would be to use openoffice's zip code, and this is what we're discussing with them currently. This solutions makes loading/saving in KOffice much more efficient than using an external ioslave. Bluebird: Are you actively participating ? Ben: can KOffice be compiled for embedded devices? Do you think making KOffice available for embedded devices would noticeably increase KOffice's user base ? David: I think this is technically possible. I don't think any of us will take the time to do that, but anyone with interest in this can surely try. Werner: It's probably no big deal to get it to compile, but it's hard to strip down the UI that it's usable. Bluebird: Thank you all for participating! This page was last edited on 10 February 2008, at 17:21.